The Holy Quran Al-Imran (The Family of Imran) Chapter 3 : Verse 104 & 110 104 - And let there be [arising] from you a nation inviting to [all that is] good, enjoining what is right and forbidding what is wrong, and those will be the successful. 110 - You are the best nation produced [as an example] for mankind. 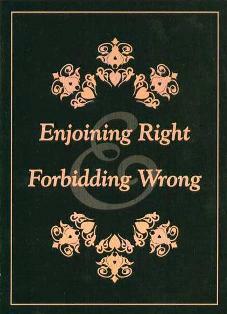 You enjoin what is right and forbid what is wrong and believe in Allah . If only the People of the Scripture (Jews & Christian) had believed, it would have been better for them. Among them are believers, but most of them are defiantly disobedient.